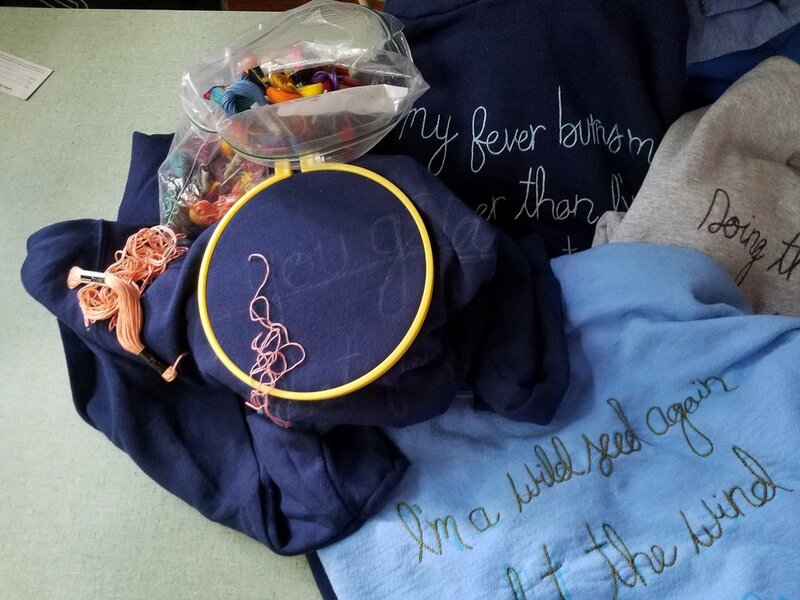 She SAid is an ongoing embroidery project I began in the fall of 2016. These pieces represent a dual purpose to me: presenting the words of Female Identifying Artists either myself and/or other people identify with, are empowered by, are eager to communicate to the communities they inhabit and navigate. The second is to wear a garment that is soft, that is safe, that is functional. I began to create these pieces after a breakup with no intention other than comforting myself. My hope is that the sweatshirts can offer the same to someone else. I use recycled (thrifted) sweatshirts and hand embroider each piece. size/color/fit and style depend on availability and intention. want one? Awesome! Simply DM me on Instagram @zoesundra or contact me via this website. Cost varies depending on length of quote and shipping.